Represents a dependent using declaration which was marked with typename. 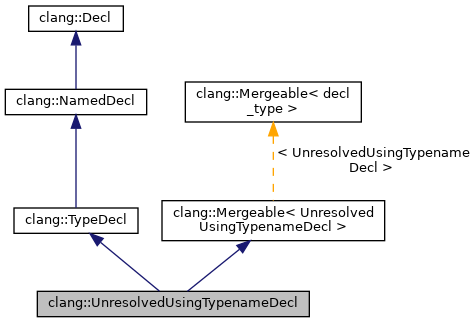 The type associated with an unresolved using typename decl is currently always a typename type. Definition at line 3674 of file DeclCXX.h. Definition at line 3748 of file DeclCXX.h. Definition at line 3749 of file DeclCXX.h. Definition at line 2827 of file DeclCXX.cpp. Definition at line 2840 of file DeclCXX.cpp. Retrieves the canonical declaration of this declaration. Definition at line 3741 of file DeclCXX.h. Definition at line 3744 of file DeclCXX.h. Get the location of the ellipsis if this is a pack expansion. Definition at line 3727 of file DeclCXX.h. Definition at line 3717 of file DeclCXX.h. 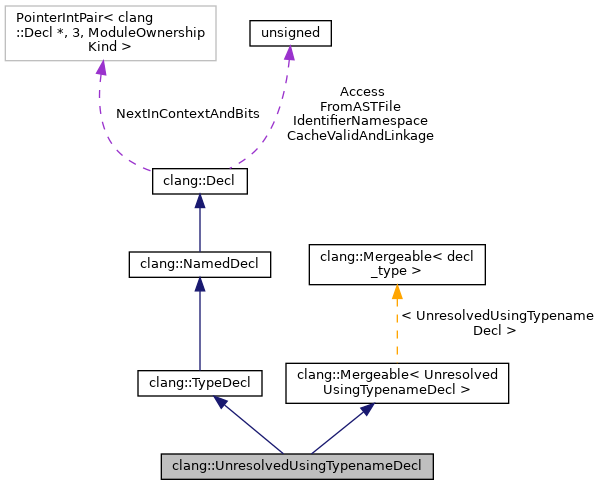 Retrieve the nested-name-specifier that qualifies the name. Definition at line 3713 of file DeclCXX.h. Retrieve the nested-name-specifier that qualifies the name, with source-location information. Definition at line 3710 of file DeclCXX.h. Returns the source location of the 'typename' keyword. Definition at line 3706 of file DeclCXX.h. Returns the source location of the 'using' keyword. Definition at line 3703 of file DeclCXX.h. Determine whether this is a pack expansion. Definition at line 3722 of file DeclCXX.h. Definition at line 3677 of file DeclCXX.h.